You’re spending WAY too much on grocery store hummus. and that’s a fact. We made a little hole in the hummus and created a puddle of olive oil – which looks weird and maybe not that appetizing in this photo, but was very tasty. The paprika also makes this look a little funky..but it’s good. just trust me this time, ok? In a food processor, puree the chickpeas and garlic with the olive oil, lemon juice, tahini, cumin, and ¾ teaspoon salt until smooth and creamy. Add 1 to 2 tablespoons water as necessary to achieve the desired consistency. Transfer to a bowl. Drizzle with olive oil and sprinkle with the paprika before serving. The original recipe belongs to RealSimple…who took a much better photo than I did…. With moving this weekend…I’m surprised you were able to post at all. Wow!! 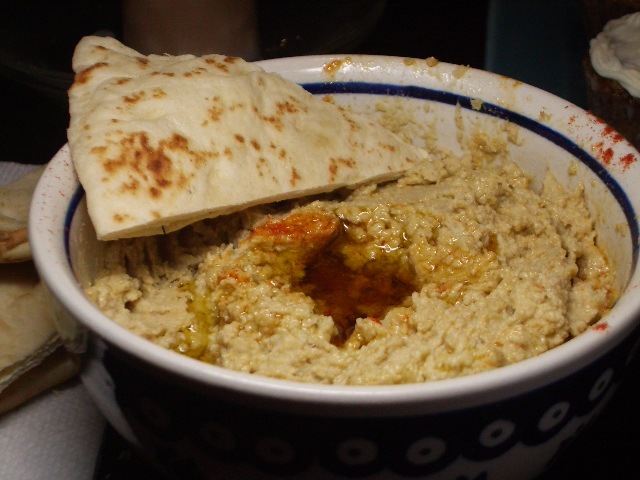 This looks delicious…I am all about homemade hummus. Makes me want to head in and make it now! I agree about the extra olive oil…tasty!